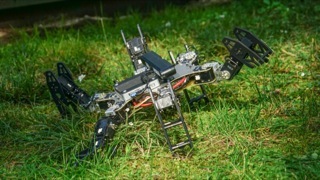 Press material for "Robots that can adapt like natural animals"
citation: Cully, A., Clune, J., Tarapore, D., and Mouret, J.-B. Damage Recovery in Robots via Intelligent Trial and Error. All images are (c) Antoine Cully / Pierre and Marie Curie University. They are distributed under the Creative Commons Attribution licence. 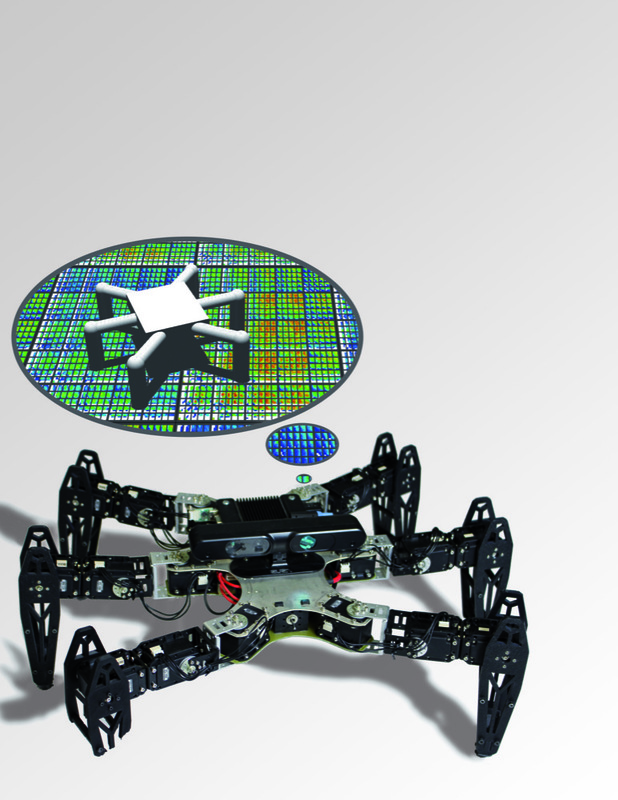 The hexapod robot with its matrix of intuitions. 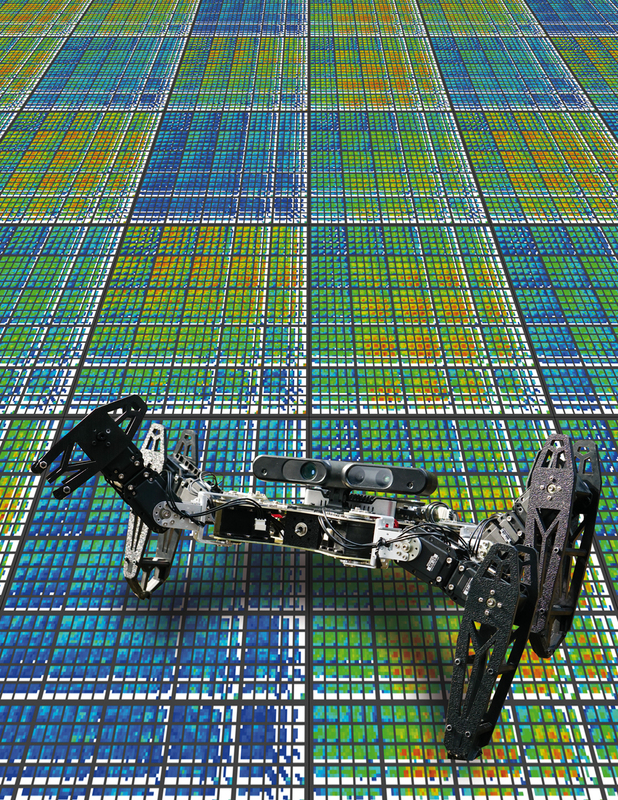 caption: A robot automatically learns to keep walking after it is damaged by using a large map of the space of possible gaits and their performance values. The pictured robot has damage in the form of a broken front-right leg. 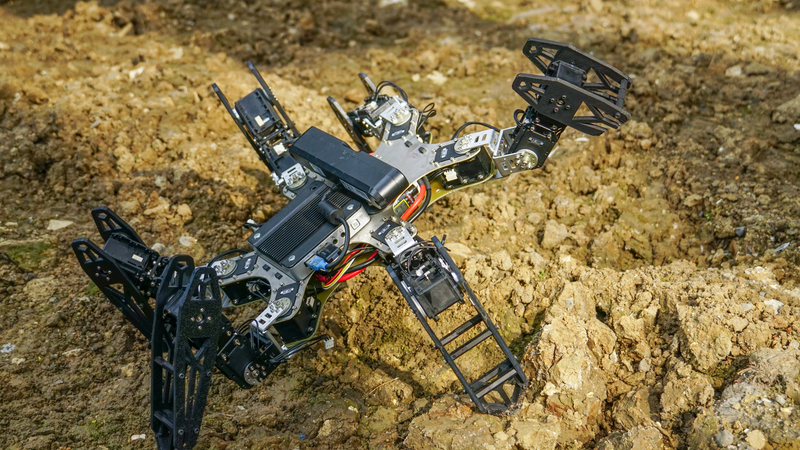 To keep walking despite that damage, it executes a newly invented ``Intelligent Trial \& Error'' algorithm, which selects a behavior the robot thinks will perform well based on previous (simulated) experience. That experience is represented in the multi-colored, 6-dimensional grid shown on the ground (see Fig. 4 of Cully et al. in this issue for how the 6-dimensional space is visualized in 2D). In this grid, each pixel represents a different gait, and the color its expected performance. If that tested behavior does not work, the robot chooses a behavior from a different region of the map meaning an entirely different type of behavior, and update the map colors to reflect the results of this experiment. 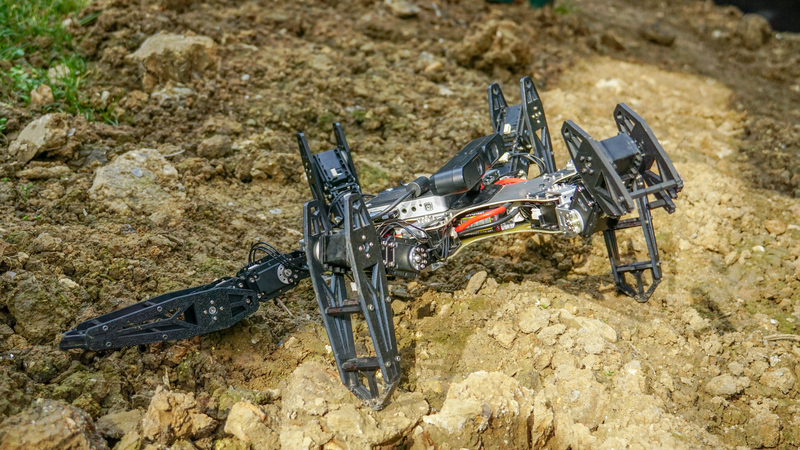 This new algorithm enables a damaged robot to get up and walk away in about a minute after trying only a handful of different behaviors. Credits: Antoine Cully/UPMC & Jean-Baptiste Mouret/UPMC. We grant permission for anyone to use these images via the Creative Common Attribution License. Please credit their authors appropriately. 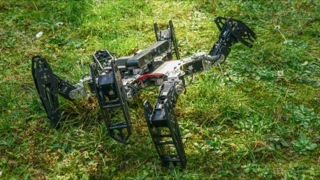 Damaged hexapod robot in the field. 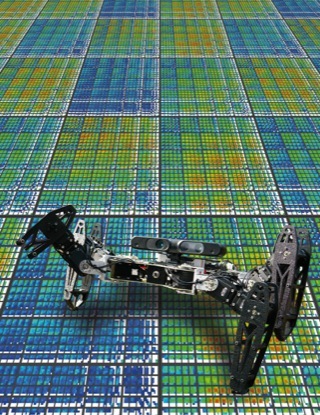 caption: A robot automatically learns to keep walking after damage via a newly invented ``Intelligent Trial & Error'' algorithm. 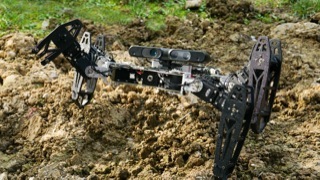 The pictured robot has damage in the form of a broken front leg. To keep walking despite the damage, it uses a large map of the space of possible actions and their performance values. Specifically, the robot selects a behavior it thinks will perform well based on the previous (simulated) experience stored in the map. If that tested behavior does not work, it moves on to a different region of the map, which means an entirely different type of behavior. This new algorithm enables a damaged robot to get up and walk away in about a minute after trying only a handful of different behaviors. 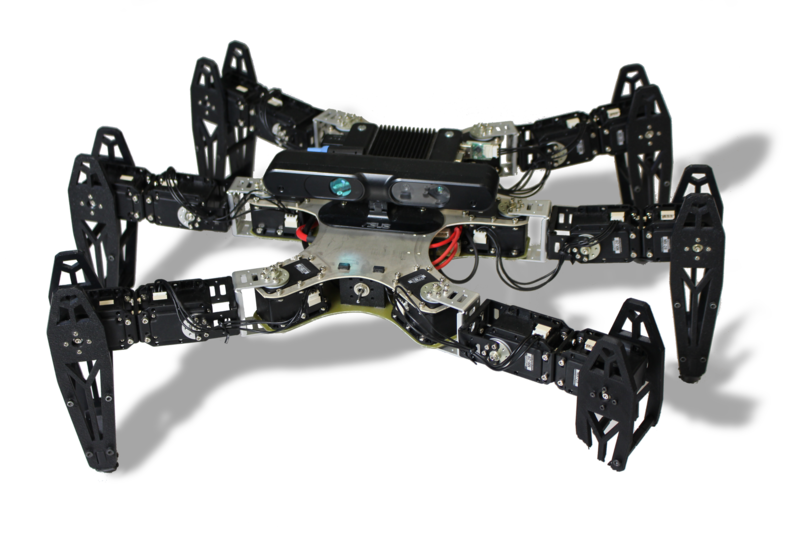 Damage conditions the hexapod robot learned to overcome. caption: A robot automatically learns to keep walking after damage via a newly invented “Intelligent Trial & Error” algorithm. The pictured robot has damage in the form of a broken front leg. To keep walking despite the damage, it uses a large map of the space of possible actions and their performance values. Specifically, the robot selects a behavior it thinks will perform well based on the previous (simulated) experience stored in the map. If that tested behavior does not work, it moves on to a different region of the map, which means an entirely different type of behavior. 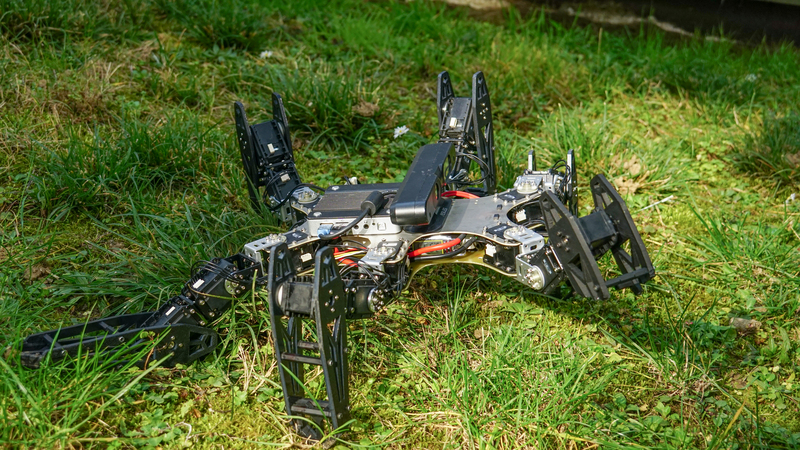 This new algorithm enables a damaged robot to get up and walk away in about a minute after trying only a handful of different behaviors. 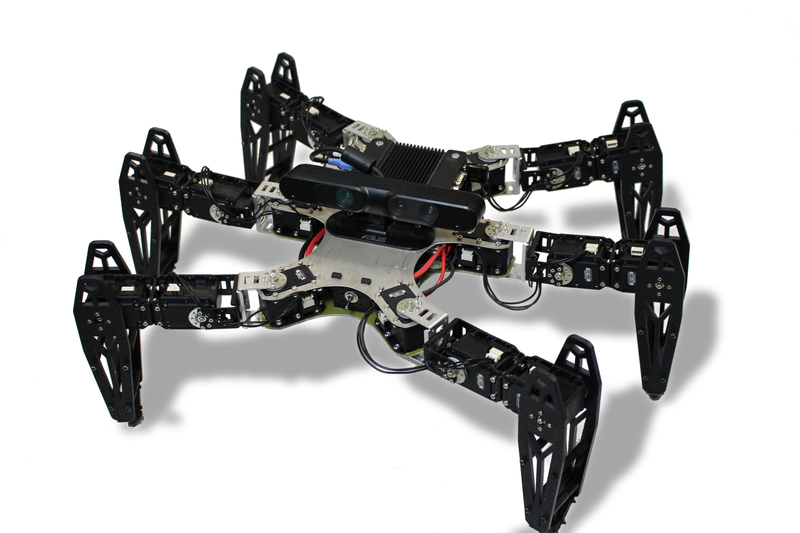 The undamaged hexapod robot from our experiments. We grant permission for anyone to use these images via the Creative Common Attribution License. Please credit theie authors appropriately. The undamaged robotic arm from our experiments. We grant permission for anyone to use this image via the Creative Common Attribution License. Please credit the authors appropriately. The two steps of Intelligent Trial and Error. caption: (a & b) Creating the behavior-performance map: A user reduces a high-dimensional search space to a low-dimensional behavior space by defining dimensions along which behaviors vary. 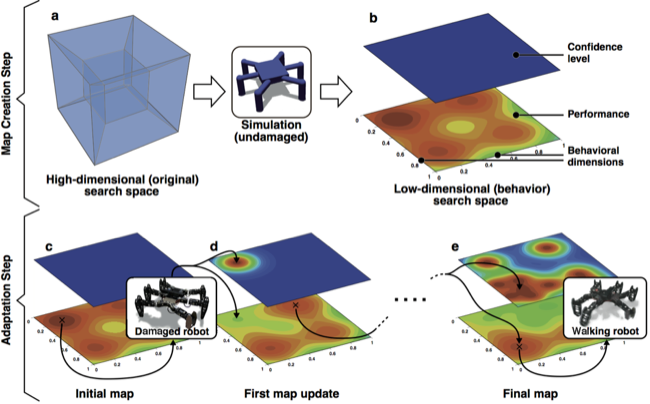 In simulation, the high-dimensional space is then automatically searched to find a high-performing behavior at each point in the low-dimensional behavior space, creating a “behavior-performance” map of the performance potential of each location in the low-dimensional space. 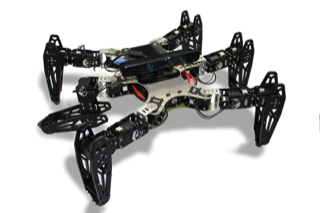 In our hexapod robot experiments, the behavior space is six-dimensional: the portion of time that each leg is in contact with the ground. The confidence regarding the accuracy of the predicted performance for each behavior in the behavior-performance map is initially low because no tests on the physical robot have been conducted. 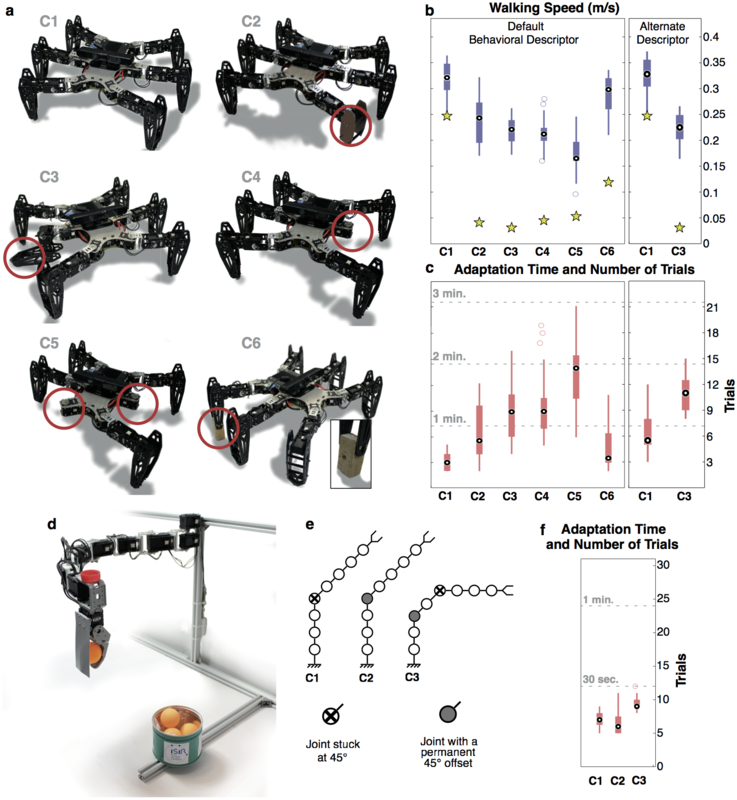 (c & d) Adaptation Step: After damage, the robot selects a promising behavior, tests it, updates the predicted performance of that behavior in the behavior-performance map, and sets a high confidence on this performance prediction. The predicted performances of nearby behaviors–and confi- dence in those predictions–are likely to be similar to the tested behavior and are thus updated accordingly. This select-test-update loop is repeated until a tested behavior on the physical robot performs better than 90% of the best predicted performance in the behavior-performance map, a value that can decrease with each test. The algorithm that selects which behavior to test next balances between choosing the behavior with the highest predicted performance and behaviors that are different from those tested so far. Overall, the Intelligent Trial and Error approach presented here rapidly locates which types of behaviors are least affected by the damage to find an effective, compensatory behavior. An overview of the Intelligent Trial and Error Algorithm. caption: (a) Behavior-performance map creation. After being initialized with random controllers, the behavioral map (a2), which stores the highest-performing controller found so far of each behavior type, is improved by repeating the process depicted in (a1) until newly generated controllers are rarely good enough to be added to the map (here, after 20 million evaluations). 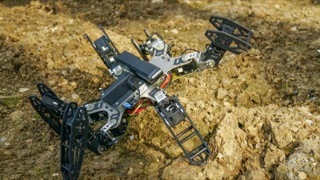 This step, which occurs in simulation, is computationally expensive, but only needs to be performed once per robot (or robot design) prior to deployment. In our experiments, creating one map involved 20 million iterations of (a1), which lasted roughly two weeks on one multi-core com- puter (Supplementary Methods, section “Running time”). (b) Adaptation. (b1) Each behavior from the behavior-performance map has an expected performance based on its performance in simulation (dark green line) and an estimate of uncertainty regarding this predicted performance (light green band). The actual performance on the now-damaged robot (black dashed line) is unknown to the algorithm. A behavior is selected to try on the damaged robot. This selection is made by balancing exploitation—trying behaviors expected to perform well—and exploration—trying behaviors whose performance is uncertain (Methods, section “acquisition function”). Because all points initially have equal, maximal uncertainty, the first point chosen is that with the highest expected performance. Once this behavior is tested on the physical robot (b4), the performance predicted for that behavior is set to its actual performance, the uncertainty regarding that prediction is lowered, and the predictions for, and uncertainties about, nearby controllers are also updated (according to a Gaussian process model, see Methods, section “kernel function”), the results of which can be seen in (b2). The process is then repeated until performance on the damaged robot is 90% or greater of the maximum expected performance for any behavior (b3). This performance threshold (orange dashed line) lowers as the maximum expected performance (the highest point on the dark green line) is lowered, which occurs when physical tests on the robot underperform expectations, as occurred in (b2). 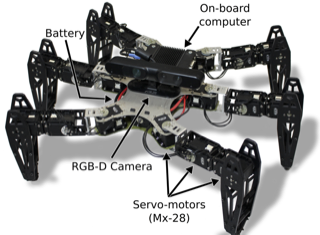 caption: (a) Conditions tested on the physical hexapod robot. C1: The undam- aged robot. C2: One leg is shortened by half. C3: One leg is unpowered. C4: One leg is missing. C5: Two legs are missing. C6: A temporary, makeshift repair to the tip of one leg. (b) Performance after adaptation. Box plots represent Intelligent Trial and Error. The central mark is the median, the edges of the box are the 25th and 75th percentiles, the whiskers extend to the most extreme data points not considered outliers, and outliers are plotted individually. Yellow stars represent the performance of the handmade reference tripod gait (Supplementary Methods). Conditions C1-C6 are tested 5 times each for 8 independently created behavior-performance maps with the “duty factor” behavior description (i.e. 40 experiments per damage condition, Supplementary Methods). Damage conditions C1 and C3 are also tested 5 times each for 8 independently created behavior-performance maps with the “body orientation” behavior description (Supplementary Methods). (c) Time and number of trials required to adapt. Box plots represent Intelligent Trial and Error. (d) Robotic arm experiment. The 8-joint, planar robot has to drop a ball into a bin. 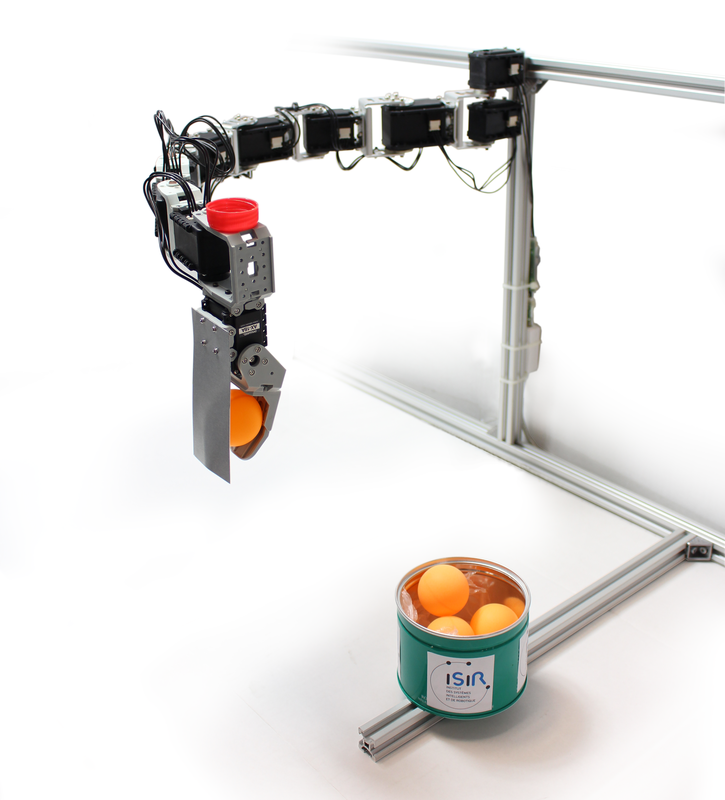 (e) Example conditions tested on the physical robotic arm. C1: One joint is stuck at 45 degrees. C2: One joint has a permanent 45-degree offset. C3: One broken and one offset joint. A total of 14 conditions were tested. (f ) Time and number of trials required to reach within 5 cm of the bin center. Each condition is tested with 15 independently created behavior-performance maps. Compared to traditional reinforcement learning (RL) approaches, our technique is much faster. That is because it was designed from the ground up to work with real robots (instead of only in simulation). It requires only a few minutes and a few physical trials on the robot, whereas RL algorithms typically have to conduct, hundreds, if not thousands, of tests to learn what to do. That is why most videos of RL on robots are sped up between 5 and 50 fold (ours is in real time). 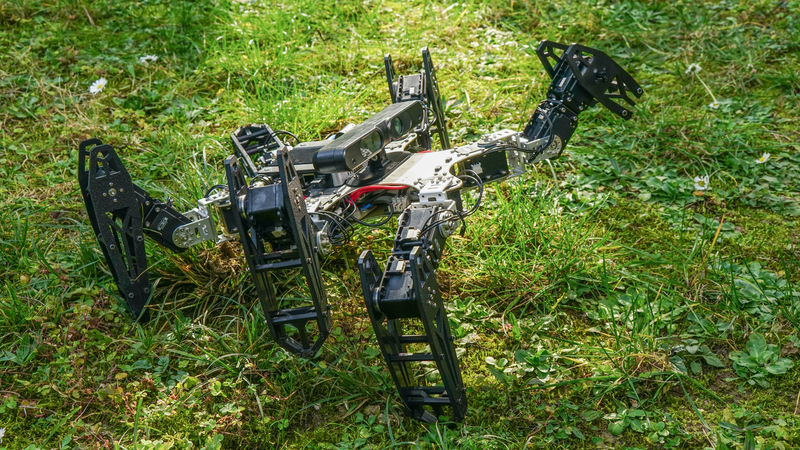 In our approach, the robot has a "simulated childhood" in which it learns different ways it can move its body, and those intuitions allow it to adapt after only a few tests and about two minutes. How does this simulated childhood help? Previous algorithms were searching for something very rare (a behavior that works given the damage) amongst a huge space of all possible behaviors. In our case, the size of this "search space" is 10^47, which is roughly the number of water molecules on earth! Very few of these possibilities are good, so previous algorithms had to search in this space to find the few, rare, good behaviors. Our algorithm searches ahead of time to collect all of the good behaviors, so instead of searching through all of the water molecules on earth, it is searching in a neatly sorted array of about 13,000 high-quality behaviors, which is much faster. We still need an intelligent learning algorithm to find the best of these 13,000 behaviors in only 10 trials, which is why we call it "intelligent" trial and error, but we already have made solving the problem much faster. In short, whereas previous algorithms searched for needles in fields of haystacks, we gather the needles ahead of time, so we are searching through a pile of needles to find the right one. Compared to traditional "diagnose and respond" (aka fault-tolerance) approaches, there are two main differences: (1) our robot does not need to know what the damage is, it simply needs a way to measure its performance; (2) we do not have a large library that specifies what to do for each type of damage. Instead, our robot learns how to cope with whatever damage comes its way. The map of behaviors is not hand-designed: it is learned by the robot. The robot uses a computer simulation of itself to create this map ahead of time. These maps can be quite large. 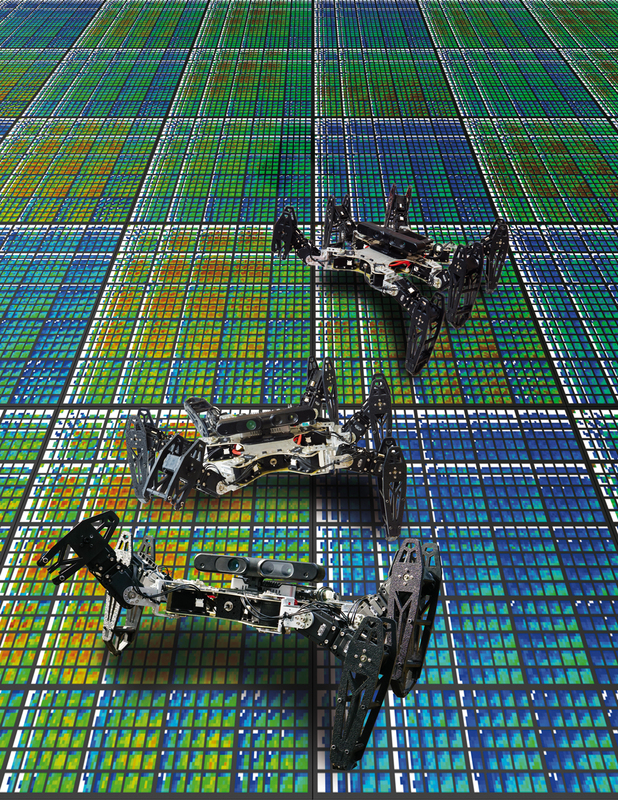 In our experiments with the six-legged robot, the map contained over 13,000 gaits. While generating that map is computationally intensive, it only has to be done once per robot design before the robots are deployed. Importantly, this map does not represent all possible behaviors the robot can make. The space of all possible behaviors that is searched to find these 13,000 high-performing behaviors is unimaginably vast. In fact, it contains 10^47 possible behaviors, which is about how many water molecules on the planet Earth! That would be too many for our robot scientist to search through once damaged. Instead, we search through this vast space ahead of time to find 13,000 high-performing gaits (via a new algorithm we invented called "MAP-Elites"). In short, whereas previous algorithms searched for needles in fields of haystacks, we gather the needles ahead of time, so we are searching through a pile of needles to find the right one. The robot does not try to anticipate the damage conditions. We do not pre-compute anything like "find a gait that works if leg 3 is missing". What we do with the simulator is simply to say "find as many different ways to walk as you can". 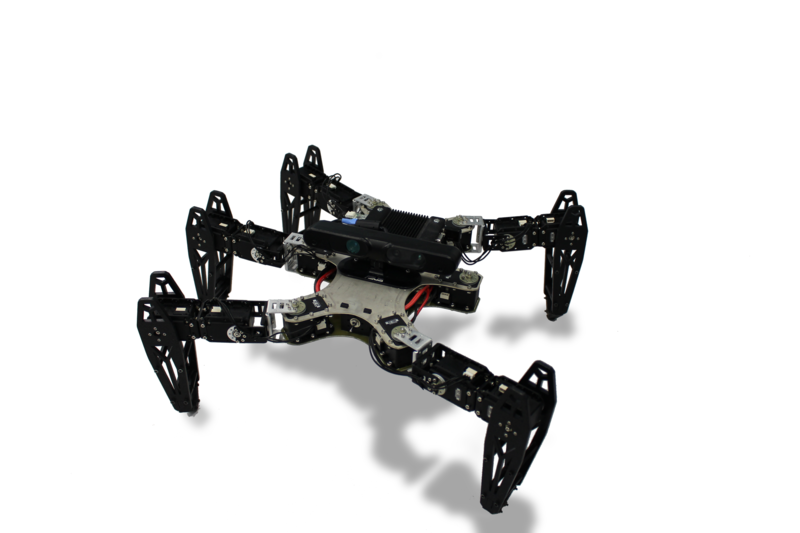 That gives the robot intuitions about different ways that it can walk that work well. It then uses these intuitions to adapt once damaged. The robot does not "repair" itself. Instead, it searches for an alternative way to work despite the damage. This is similar to what a human with an extremely painful knee would do: he will quickly find a way to limp so that the knee hurts less. But that does not mean he has adapted via healing: instead, he has adapted to deal with the damage that exists, yet still walk. Healing is something that would happen over a longer timeframe. For example, our algorithm could cause the robot to keep functioning until it is possible for it to take itself in for repair. We started working on this problem at the Pierre and Marie Curie University in September 2011, and on this specific technique in September 2013. Actually, one of the most surprising thing with this research is that it worked very quickly. One of us (JBM) talked with Antoine, the PhD student who led this work, and a few days later Antoine had a working implementation that worked so well in the first experiment that JBM did not believe him! We of course then performed many, many experiments, to be sure that we were not just lucky in the first experiment, but that it worked for many different damage conditions, on different robots, and with different parameters. So, Antoine did the same experiment again and again: Overall, Antoine did the experiment 240 times with the six-legged robot and 210 times with the robotic arm! Working with real robots is a slow, laborious process, so that took months. We then spent quite a long time analyzing the results and writing the paper to make all of the details as clear as possible. Two years ago, we had a scheduled visit from high-profile scientists. Because our university wanted everything to look great for these important visitors, the university applied wax to the floor the day before. The floor was clean and shiny, which looked nice, but it was also much more slippery! We tried the gait our algorithm had previously learned, which we had tested many times to make sure it would work for these visitors, but it did not work at all. Fortunately, however, our robot can adapt! 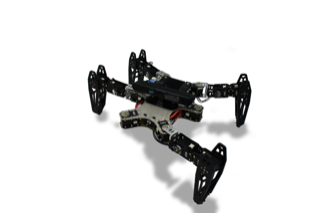 We launched our adaption algorithm, and a few minutes later, our robot was walking again on the newly waxed floor. As you can imagine, our visitors loved our work. Another surprise was the following: To create a diversity of behaviors, we used evolution to produce a variety of different ways to walk. We did that by selecting for many different types of walking, measured as robots that have their feet touching the ground different percentages of the time (100%, 75%, ..., 25%, 0%). We thought evolution of course would not be able to solve the 0% case, but it surprised us! It flipped over on it's back and crawled on its elbows with its feet in the air. According to the common definition, learning is "gaining knowledge or skill by studying, practicing, being taught, or experiencing something" (Merriam-Webster). Here, the robot uses a simulation of itself to autonomously find thousands of different good ways to walk: it is gaining knowledge by practicing in its ``head''. Since we did not explain to it how to walk, it is already learning autonomously. 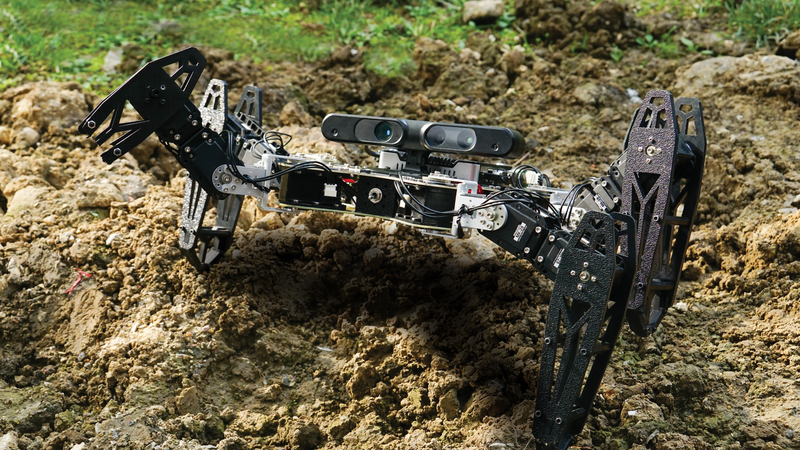 Once damaged, the robot conducts experiences and update its knowledge about the performance of each possible behavior (the update is done with a machine learning algorithm: a Gaussian process regression). It cannot try all the 13,000 behaviors that it stored before, therefore it has to leverage its knowledge to conduct the most informative and the most useful tests: in most cases, it tests less than 10 behaviors to find one that works in spite of the damage. Therefore, we can say that the robot learns how to walk for the same reason that we say that a child learns to shoot a ball in a ring: the robot practices, updates its knowledge, and try again until it has acquired the skill it needs. Who are the authors of this work?